Minecraft is becoming more and more popular as more people start to join in. I actually play it as well, but not to the extent as this person. This isn’t a replica of Link to the Past, but there are a lot of locations that you will see and recognize. Some people question how a person can sit there and just build. I say those people are ignorant of the addictive play that is Minecraft. I try to avoid playing for an extended amount of time, but my own college buddies often play in between classes to pass the time. Some of them play for hours on end, and have complex puzzles and dungeons built. It’s the overture song from E3! Ah, what a nice song. I think this is going along quite well, and it’s interesting to see a video of a Zelda dungeon using ‘Link’s Weapons’ against creepers and other Minecraft baddies. 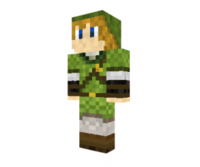 My own skin on Minecraft is of Dark Link, and now I feel compelled to make my own Zelda world on it.